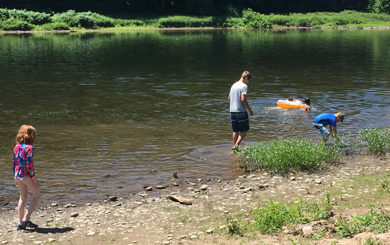 UDC Announces Outcome of 2018 Summer River and Shoreline Clean-ups - Upper Delaware Council, Inc.
NARROWSBURG – The Upper Delaware Council, Inc. (UDC) awarded $5,370.58 to support river and shoreline clean-up projects in the summer of 2018. •	Town of Deerpark – $2,960.58 for Town Highway Department labor, equipment, and dump fees to pick up debris along 2.9 miles of NYS Route 97 along the Hawk’s Nest area of the Upper Delaware Scenic Byway three times. •	Town of Tusten – $885 to contract with Kevin and Donna Freda to clean up litter and dispose of recovered trash within town boundaries between Skinners Falls and Kunkelli’s Hill. The Ten Mile River Boy Scout Camps did a volunteer clean-up as well as the Fredas donating one day of service. •	Town of Lumberland – $775 towards a contract with Ann Steimle to collect river trash between Camp Tel-Yehuda and the Mongaup River Access every other week. •	Damascus Township – $750 to purchase equipment and arrange for livery services for the Calkins 4-H group to clean up 13 river miles and 26 shoreline miles between Callicoon and Skinners Falls.